When I take group sessions on nutrition, I’m often asked about the importance of calcium supplements. Are calcium tablets needed, how much calcium should I eat, doesn’t every woman need calcium after 30 years of age to prevent osteoporosis, etc, etc. You don’t need supplements if there’s adequate calcium in your diet and you are not deficient in this mineral. Osteoporosis (commonly referred to as porous bones) refers to weak bones with a higher tendency to break or fracture. Lack of calcium and vitamin D, family history, early menopause, smoking, excessive alcohol, lack of exercise, excess intake of carbonated beverages and caffeine, extreme weight loss programs, are some of the risk factors for osteoporosis. Intake of adequate calcium thru the diet does help in preventing or arresting the progression of osteoporosis. Controlling the other risk factors is equally important. Green leafy vegetables like spinach, mint, methi, amaranth, sarson, betel leaf and so on. Almonds, walnuts and sesame seeds. Dry fruits like black currants, dates, etc. These foods are useful for everyone, but specially so for those who are lactose-intolerant (cannot digest milk and milk products). Use calcium supplements only if you have calcium deficiency. 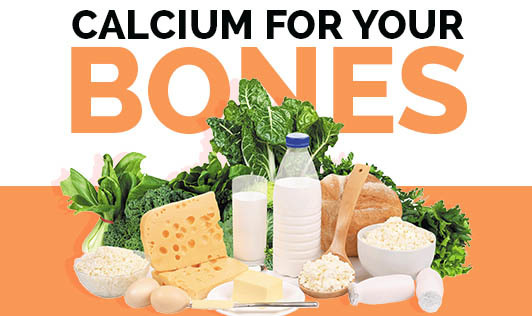 Otherwise, there’s plenty of calcium in foods to protect your bones. Don’t forget your daily dose of sunshine and exercise for strong bones. Healthy bones is a life-long commitment.